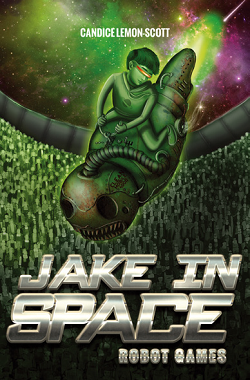 Jake in Space is a series of sci-fi adventure stories full of action and suspense, plus a little bit of weird stuff. Jake lives in the future. His home base is a space station on Earth but he travels throughout the solar system, solving mysteries and thwarting villains before they can carry out their evil plans. In each story, the Central Intergalactic Agency (CIA) sends its cyborg, Henry, on a secret mission. Jake ends up helping his cyborg friend but things never seem to go according to plan.